If you are a member of Audible—and if you like audiobooks I think you should be—then they now give you two of six selected books for free every month. They call this Audible Originals, and while you only get six books to choose from, I am not complaining about getting something for free. I got two books, The Coming Storm by Michael Lewis—read by the author—and Emma by Jane Austen (I guess)—which I guess is an audio drama. I haven’t listened to it yet. I just finished The Coming Storm. It is pretty short, just a tad over two hours, so I finished it on my walk to and from work yesterday and today. Tornadoes, cyclones, tsunamis…weather can be catastrophic, especially when we aren’t prepared for it. 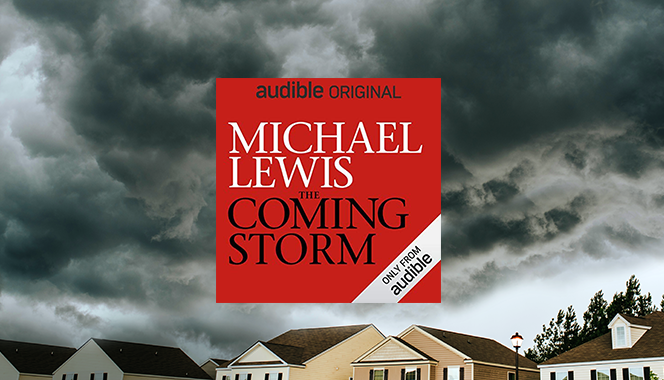 In his first Audible Original, best-selling author Michael Lewis (Moneyball, The Big Short) delivers and narrates new research on weather data, exposing terrifying potential consequences relating to how Washington plans to release it. Delving into the institutions that provide lifesaving forecasts, Lewis uncovers cracks in the system, from the perils of privatization to our fraught relationship with science, positing that a failure of imagination may be the greatest risk of all. The book tells a number of stories about weather forecasting and scientist involved in it—and it tells us where the title “Data Scientist” came from, which I did not know. If you have an Audible membership and haven’t chosen your two books yet, I would strongly recommend this one.